Veblen Goods are a class of goods that do not strictly follow the law of demandLaw of DemandThe law of demand states that the quantity demanded of a good shows an inverse relationship with the price of a good when other factors are held constant, which states that there exists an inverse relationship between the price of a good or service and the quantity demanded of that good or service. Veblen goods violate the law of demand after prices have risen above a certain level. The Veblen Effect is the positive impact of the price of a commodity on the quantity demanded of that commodity. It is named after American economist and sociologist Thorstein Veblen, who studied the phenomenon of conspicuous consumption in the late 19th century. Consider the demand curveDemand CurveThe Demand Curve is a line that shows how many units of a good or service will be purchased at each possible price. The price is plotted on the vertical (Y) axis while the quantity is plotted on the horizontal (X) axis. Demand curves are used to determine the relationship between price and quantity shown above. As the price of the commodity rises from P-A to P-B, the quantity demanded of the commodity falls from A to B. As the price of the commodity rises from P-B to P-C, the quantity demanded of the commodity falls from B to C. Between prices P-A and P-C, the law of demand holds and there exists an inverse relationship between the price of a commodity and demand for that commodity. However, for prices beyond P-C, the Veblen Effect dominates the law of demand. As the price rises from P-C to P-D, demand increases from C to D. For all the prices above, P-C, the law of demand does not hold, and there exists a positive relationship between the price of a commodity and demand for that commodity. In Veblen’s analysis of conspicuous consumption, the economist noted that for certain luxury goods and services, a higher price was often associated with the perception of higher quality. Therefore, a price increase was seen as evidence of the producer improving quality. For example, the demand for a designer handbag rises with an increase in its price. The price increase is viewed by consumers as evidence that the producer of the designer handbag has improved the quality of the handbag. Veblen goods are often positional goods. The quantity demanded of a positional good depends on how the good is distributed in society. 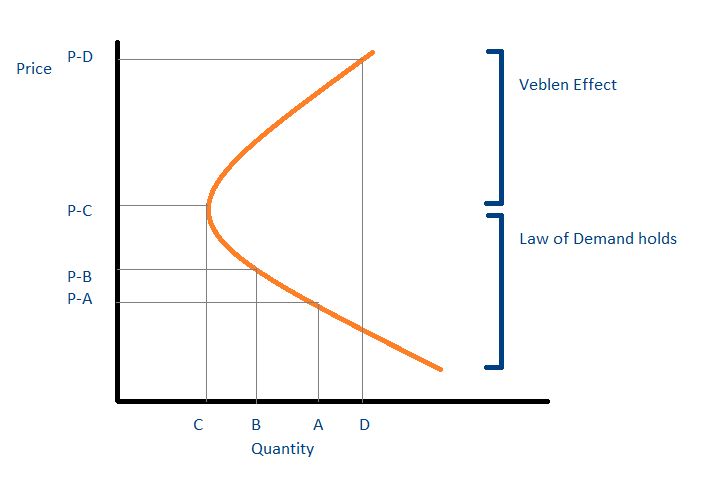 Veblen goods often exhibit a negative positional effect, i.e., the quantity demanded of a Veblen good increases with a reduction in the distribution of the good. It occurs because the utility gained by a consumer from holding such a good arises purely from the fact that few other consumers hold it. For example, the utility gained by a consumer from owning a diamond-encrusted handbag might arise primarily from the fact that few other people in society can afford to own such an object. Thus, for this consumer, the diamond-encrusted handbag acts as a positional good. Giffen goodsGiffen GoodA Giffen good, a concept commonly used in economics, refers to a good that people consume more of as the price rises. Therefore, a Giffen good shows an are another class of goods that do not strictly follow the law of demand. Unlike Veblen goods, which violate the law of demand after prices rise above a certain level, Giffen goods violate the law of demand until prices rise above a certain level. In addition, Giffen goods exhibit a negative income effect. The price of a Giffen good and the quantity demanded of the good also shows a positive relationship.